I love, and I mean I lovvvvvvvvvvvvvvvvvvvve monkeys. These sock monkey crocheted toddler mitts are AWESOME! Created by CLF Member Debz for her etsy store these are too wonderful for words! These would make FABULOUS christmas presents…heck they’d be the perfect ANYTIME present! Because I love these so much I am awarding them the Hookalicious Award for outstanding croheted wonderfullness…and yes, wonderfullness is a word cause I say so! This afghan totally rocks! I am a huge fan of simple, clean lines. Black and white can do some of the most wonderful things in design, and this blanket proves it! CLF Member carro, made this lovely afghan for the home out of Alpaca from Webs. I cannot find the words to express how delighted I was visually the moment the photo caught my attention! Carro designed this lovely piece after catching a glimpse of a similar thow in a movie. This is a great testament to simplicity exuding excellence! Carro congratulations you are duly awarded the Hookalicious Award for orochet excellence in design! I love making soap savers, and they are one of those satisfyingly quick, useful, and welcome projects in the heat of summer! 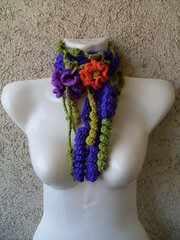 Congrats to CLF Member dbknfivec (Kathy North) for earning a Hookalicious Award! Why? For a soap saver? Because, I am in love with the design, and making something useful AND pretty. I get requests for these puppies from family, and friends at birthdays and holidays. In fact, I recently crocheted up a quickie for my son’s 13th birthday, because the night before he asked sheepishly if I could crochet him a birthday present. Sure, it was 11pm, sure I was tired, but when your almost teenage son requests a crocheted present? And he loved his very masculine version of a soap saver. So, Kathy, YOU WIN! Because I am biased, and love these kinds of projects! And that photo is lovely! 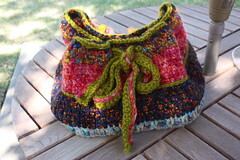 If you have never made soap savers, check out Kathy’s pattern for this very wonderful award winning bag!